Don Carlos once said, “My dream wasn't to be the biggest, just the best”. 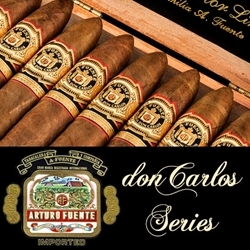 The Arturo Fuente Don Carlos Series is named after its legendary creator and family patriarch Carlos Fuente, Sr. Each of the hand-rolled premium cigars listed below in our Don Carlos Series is carefully crafted with unique blends of vintage tobaccos that are hand selected and aged up to 10 years. Infused with binders and fillers from the Dominican Republic, these premium cigars are crafted completely by hand and bundled up with rich and flavorful African Cameroon wrappers. This process gives each smoker who lights up an Arturo Fuente Don Carlos cigar a rich, spicy, and full-bodied smoking experience that is perfectly consistent and flavorful. Stock up your humidors with these masterpiece premium hand-rolled cigars that bear his name, Don Carlos! The Arturo Fuente Don Carlos Series are hand rolled premium cigars that make an excellent choice for any cigar connoisseur. Smokers Discounts has made it easy and affordable to buy premium cigars online. A variety of sizes and flavors are listed below at our discount online cigar store. Each of these styles are in stock and available. Call us for more details!